I just focused on the bright NGC4618, which appeared roundish and almost evenly bright with averted vision. Roundish, evenly bright, faint, less apparent. Barely visible with direct vision, evident with averted vision. Round, evenly bright. M51: Round with bright, very compact core, otherwise evenly bright. NGC5195: Slightly oval with brigher center. Both galaxies are very evident, visible with direct vision and easily separable. M51 appears quite large, nearly evenly bright and roundish with a very distinct, bright and compact center. NGC5195 in comparison is obviously smaller with an also bright, compact center, which is surrounded by a fainter, roundish halo. At 23x both galaxy visible and separate, whereby NGC 5195 is noticeable fainter. At 66x Messier 51 showed a compact, brighter nucleus and a round, fainter, evenly bright halo. 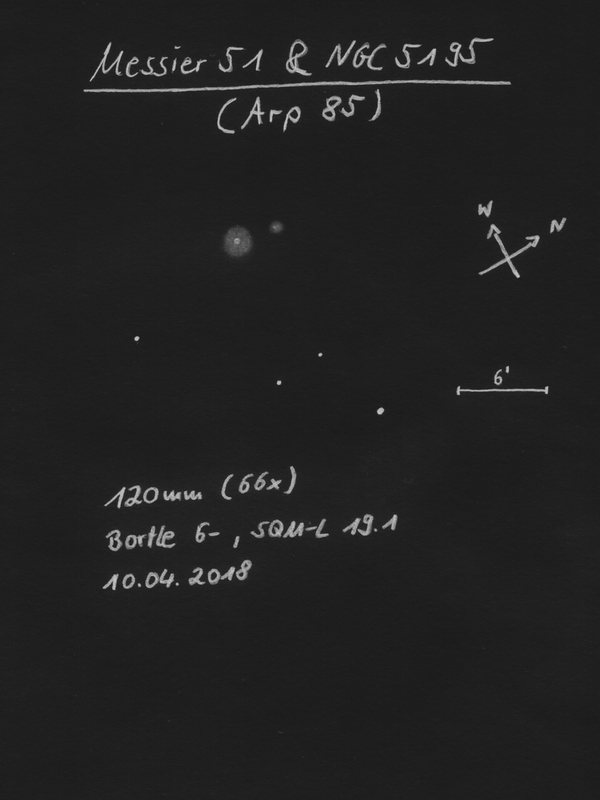 NGC 5195 can be at 66x well seen with averted vision, oval with slightly towards south shifted, brighter core. M51: At 37x bright, stellar core with round, relatively faint halo. At 100x with averted vision two evident spiral arms, winding widely around the core. A foreground star southwest of the core within the halo. NGC5195: Bright, oval with very compact nucleus, which is slightly shifted towards southwest. I tried the bright NGC4490, but without success. NGC4485: Quite small, roundish, evenly bright. NGC4490: At 28x slightly elongated, evenly bright. At 60x a bit brighter center. NGC4485: At 23x not very evident, slightly oval, evenly bright. At 48x conspicuous and getting slightly brighter towards the middle. NGC4490: At 23x very evident, oval, slightly condensed and barely visible with direct vision. At 48x easily seen with direct vision. NGC4485: At 37x well visible with averted vision as fairly small brightening. At 96x slightly oval. I just tried the bright NGC4631. NGC4627: Round, relatively small nebula, which can be easily seen at 96x with averted vision. A moderately faint star located between the centers of NGC4631 and NGC4627.